An American Airlines passenger was restrained Friday after his flight landed in Miami, a spokeswoman for the Miami International Airport said. Authorities were called to the scene of American Airlines Flight 320, which had departed from Montego Bay, Jamaica, spokeswoman Maria Levrant said. CNN affiliate WSVN reported that the passenger tried to rush the cockpit, and was restrained by two other passengers before authorities arrived at the scene. 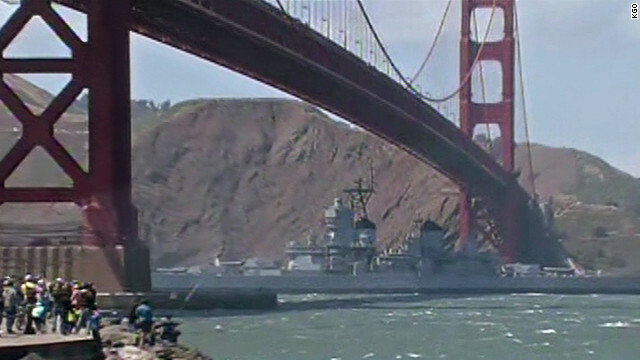 The USS Iowa makes its way under the Golden Gate Bridge at the start of its 400-mile journey to Los Angeles. Decades after transporting President Franklin Roosevelt across the Atlantic and fending off kamikazes in the Pacific during World War II, the USS Iowa passed Saturday under the Golden Gate Bridge en route to its final home and duty as a living museum. Fireboats shot water into the air to salute the battleship around 3 p.m. Saturday, as it was towed through San Francisco Bay and into the Pacific Ocean. Scores of people watched from nearby - some on ferries, others from onshore and on the iconic bridge - under blue skies dotted with puffs of clouds. The USS Iowa fired nearly 12,000 rounds over its more than 50 years in service for the U.S. Navy before being decommissioned for a third and final time in 1990. After more than a decade docked in the Port of Richmond near San Francisco, the ship is heading south to the Port of Los Angeles in the care of the Pacific Battleship Center, which plans to transform the ship into a museum by July, according to the nonprofit group's website. 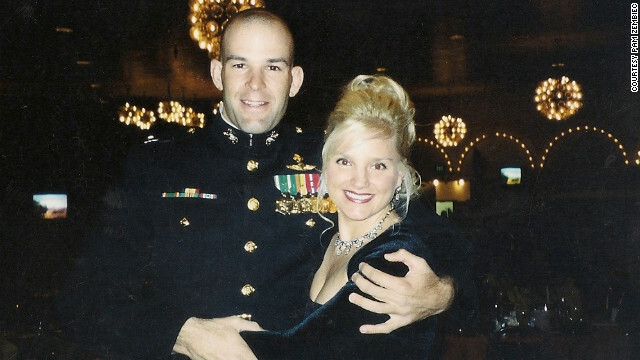 Maj. Doug Zembiec and his wife, Pam, attend the Marine Corps Ball in 2003. He was killed in 2007. When many Americans kick off the start of summer with burgers and beers for Memorial Day, one former Navy SEAL will be in the final stretch of a 1,700-mile, month-long cross-country journey. Coleman Ruiz, executive director of Carry The Load, is just one of many veterans making the hike to drive attention and resources to organizations that help surviving military families. They hope it will remind communities of the true meaning of Memorial Day. In 2011, Clint Bruce, former Navy SEAL, co-founded Carry The Load as a way to honor fallen service members and to remember surviving military families. In its second year, Carry The Load is taking a two-fold approach to fundraising. Beginning in West Point, New York, communities were invited to participate in the 1,700-mile national relay, which was divided into 5-mile segments. On top of that, the national trek will conclude in Dallas with a nonstop 20-hour, 12-minute walk on Memorial Day. "It's about putting one foot in front of the other," said Ruiz, who invites individuals from local communities to participate by walking as much or as little as they can. "Walk a mile or walk 50 miles. But just come out and do what every single family across the country who has lost an American service member does. All those families get up every day and put one foot in front of the other. It's the least we can do to show them that we care." Ruiz knows personally the pain of losing a loved one. In 2007, one of his best friends, Maj. Doug Zembiec, was killed in Baghdad while leading a combat operation. "There isn't another human being that I've met who can lead men the way Doug could," Ruiz said. 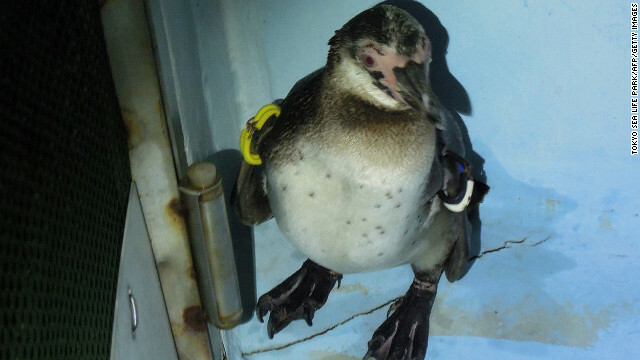 Filed under: Military • U.S.
Tokyo Sea Life Park's fugitive penguin has finally been caught. When a 1-year-old Humboldt penguin that escaped from a Tokyo aquarium three months ago dared to set foot on land in Ichikawa on Thursday night, it was captured by hand and finally collared, The Japan Times reported. An aquarium employee was walking alongside the Edogawa River in Chiba Prefecture at 5:30 p.m. and spotted the fugitive penguin, which escaped in March. The penguin was seen swimming in the river near the Kanamachi water purification plant in Katsushika Ward earlier in the week. Last week, people also saw it thriving and snacking on small fish in Tokyo Bay. It was assumed that the bird was finding some place to rest onshore at night. The fugitive bird, known as Penguin 337, somehow scaled a 13-foot wall and got through a barbed-wire fence to get into the bay. Aquarium officials believe it escaped through small gaps that cats and frogs can pass through. Officials from Tokyo Sea Life Park feared the penguin would not survive in the waters of the bay, busy with marine traffic headed for densely populated Tokyo. The penguin was filmed by a Japanese coast guard patrol craft on May 7, but the crew was unable to catch it then. Penguin 337 is one of 135 penguins at Tokyo Sea Life Park. 1:00 pm ET - SpaceX Dragon status briefing - The SpaceX Dragon spacecraft has a rendezvous with the international space station today. NASA and SpaceX officials discuss the mission this afternoon. NASA said it has given the go ahead for the first private spacecraft to proceed toward a rendezvous with the International Space Station on Friday. "The International Space Station mission management team completed a thorough review of the progress ... and ... unanimously authorized the International Space Station and Dragon flight control teams to proceed toward rendezvous and berthing about 11:20 a.m. ET Friday," the NASA website said. The Dragon capsule is carrying food, clothing and scientific experiments. Syrian protesters spilled out into the streets after morning prayers Friday as regime forces shelled various opposition neighborhoods, activists said. Planned protests were under way in various neighborhoods including the capital Damascus and the provinces of Homs, Hama, Aleppo and Deir Ezzor. As the protesters gathered, regime forces shelled the Homs neighborhoods of Sultanieh and Jobar, opposition activists said. Security forces killed at least eight people in Syria on Friday, including seven in Hama province, according to the Local Coordination Committees of Syria. One more person was killed in Qusair town in Homs province, the group said. Egypt's Muslim Brotherhood predicted Friday that its presidential candidate Mohamed Morsi will contest a run-off vote with former regime figure Ahmed Shafik, as counting in the country's landmark election got under way. A statement on the official Facebook page of the Freedom and Justice party, the political wing of the Muslim Brotherhood, indicated that Morsi had received 30.8% of the votes cast to 22.3% for Shafik. The Muslim Brotherhood said it had observed the counting of 51% of the vote. If no candidate gets a majority of the vote in the first round, a second round will be held June 16-17. There were 13 candidates on the ballot, although two withdrew from the race after ballots were printed. The new French president, François Hollande, arrived in Kabul on Friday to meet with French troops stationed in the country and hold talks with Afghan President Hamid Karzai. This visit follows Hollande's announcement at the NATO conference in Chicago that French combat troops would withdraw from Afghanistan by the year end of the year. As part of the the NATO-led International Security Assistance Force, French trainers will remain in the country longer. NATO countries are trying to figure out how to meet a 2014 deadline to withdraw from an unpopular war in Afghanistan while shoring up that nation's security forces. Bud flexed its muscles as it closed on the southwestern coast of Mexico late Thursday, becoming a major hurricane with winds of 115 mph, the National Hurricane Center said. The Category 3 storm was about 170 miles (270 km) southwest of Manzanillo and about 230 miles (370 km) south of Cabo Corrientes at 8 p.m. (11 p.m. ET) It was moving north-northeast at a rate of about 10 mph. "Some fluctuations in strength are possible tonight and Friday morning before gradual weakening begins by Friday afternoon," the hurricane center said. "However, Bud is still expected to reach the coast of Mexico as a hurricane" late Friday. A hurricane warning has been issued for Manzanillo northwest to Cabo Corrientes, where winds are expected to exceed 39 mph within the next 36 hours and eventually top 74 mph.